As part of the Petrushka project primary school pupils from Bochum developed their own new version of the Petrushka story together with puppeteers and musicians from the Bochum Symphony Orchestra under the direction of Richard McNicol. In what follows you can learn more about the ideas behind the project and how they were realised. Teaching materials and detailed information on creative work with children can be found under For teachers. The performance of Petrushka in the midst of a colourful fair offered the perfect opportunity for a creative musical project for primary school pupils based on Stravinsky’s musical ideas. Through their own active engagement with musical tasks and challenges similar to those faced by Stravinsky himself, children’s enthusiasm for and understanding of a work like Petrushka can be awakened. The aim was not to imitate Stravinsky, but rather to allow children to gain insights into a musical masterpiece through their own creative activities. In order that the children’s fantasy could have free rein, they did not hear Stravinsky’s music itself until after the end of the workshops. Stravinsky’s Petrushka tells the story of three puppets who are mysteriously brought to life. 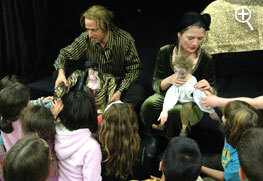 It thus seemed appropriate to involve puppeteers in our primary school project. The starting point of the project was a puppet show version of the Petrushka story, developed specially by the Berlin puppeteers Johann Boehncke and Jeannette Luft. Starting with a short scenario written by Sascha Pranschke they created a 20-minute version of Petrushka. 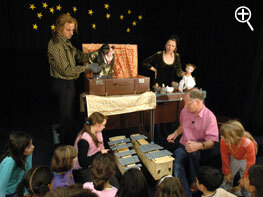 As no words are used during the telling of the story, the music takes centre stage. Five weeks before the performance the puppeteers gave introductory workshops in the Graf-von-der-Recke primary school and the Köllerholz School in Bochum to introduce their version of the story to an audience of eight and nine year old children. 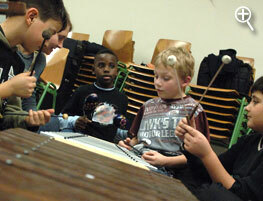 In subsequent workshops the children invented their own music to the scenes of the puppet show with the help and support of six musicians from the Bochumer Symphoniker and Richard McNicol. Teaching materials and detailed information on creative work with children can be found under For teachers. 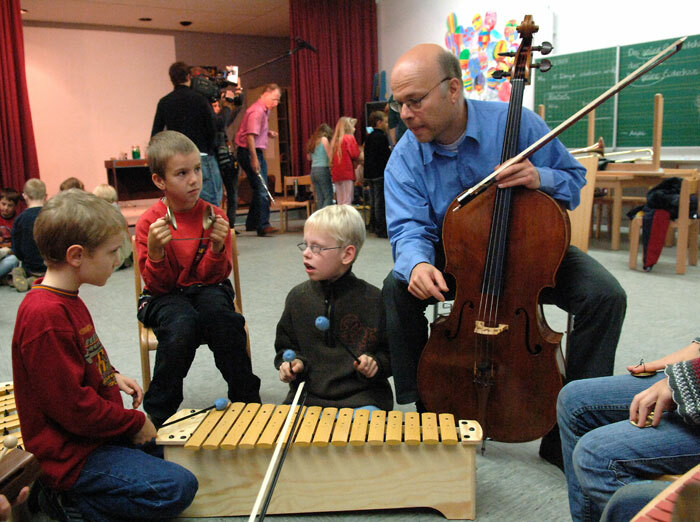 Creative projects like the Petrushka project, which consciously seek to involve entire classes of children of varying abilities and from different cultural backgrounds in the invention and performance of their own music, do not merely seek to provide musical instruction. They have an important social function. In the workshops pupils are encouraged to work in small groups, to discuss their ideas and to develop them together. In this way they learn important social and personal skills. Among other things they learn how to negotiate and reach agreement with others, to accept their fellow pupils as equal partners whatever their perceived limitations, to concentrate on a given task and to present the results of their work in a public setting. In addition to their creative engagement with Stravinsky’s music the children in the Petrushka project came to understand the art of the puppeteer. They saw how the puppets were specially made for this project and, through their work with Johann Boehncke and Jeannette Luft, gained insights into the skills of puppeteers in ‘bringing their puppets to life’. Through their close cooperation with artists and musicians, teachers also gained new methodological and thematic insights on which they will be able to draw in their own continuing work in the classroom. The creative energies released by the workshops thus have a lasting benefit and continue to enhance school life long after the end of the project.